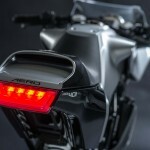 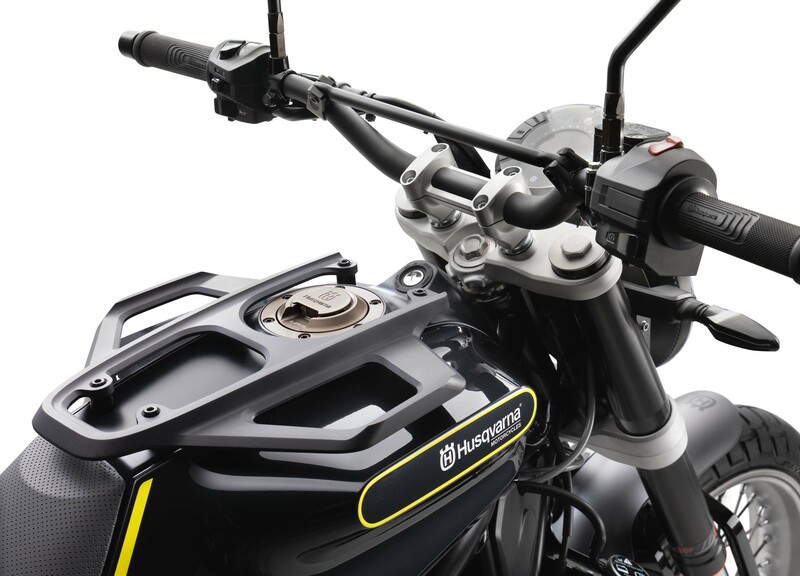 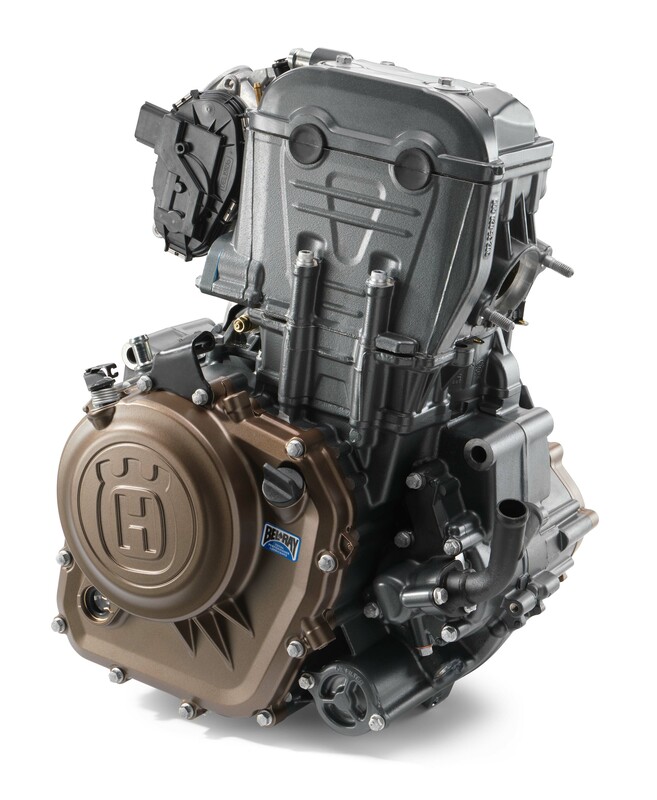 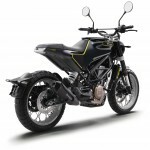 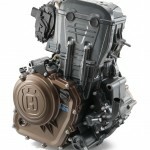 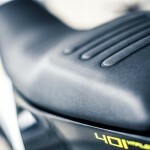 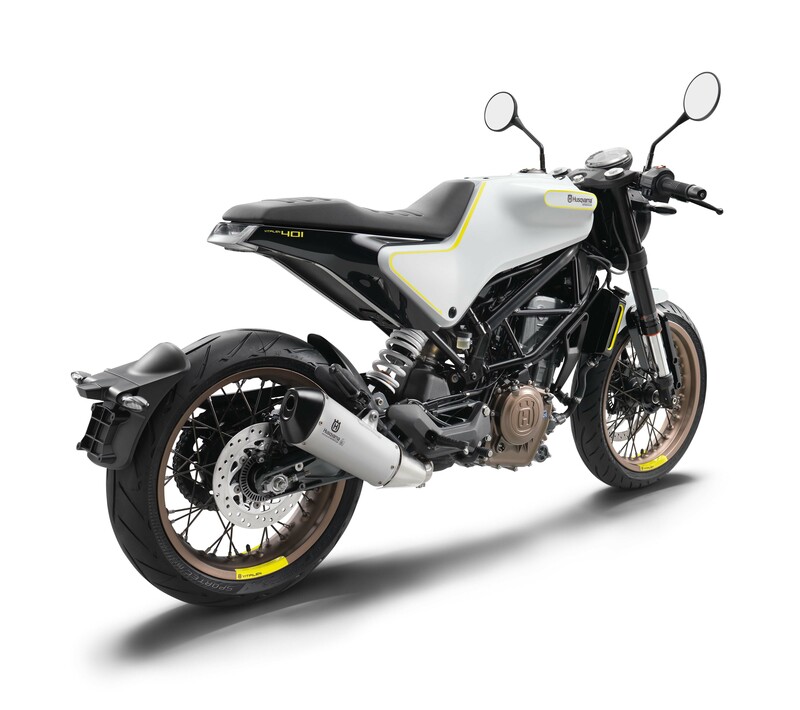 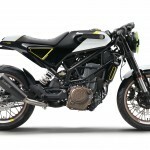 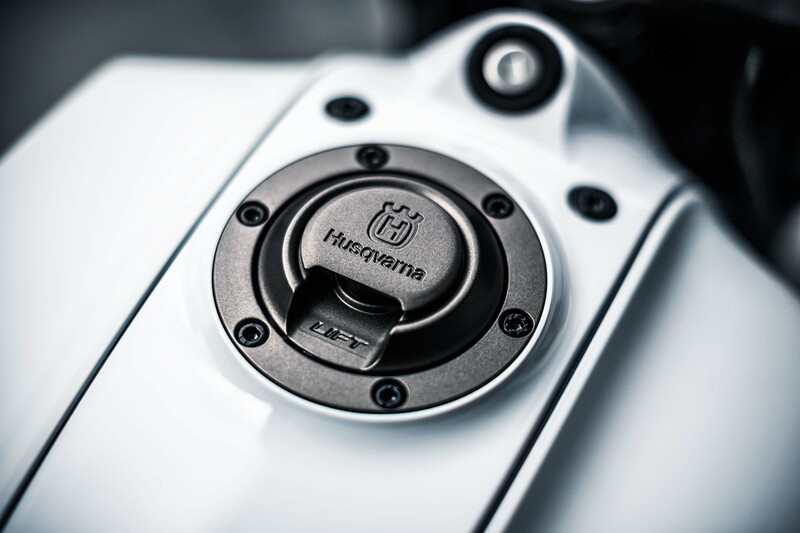 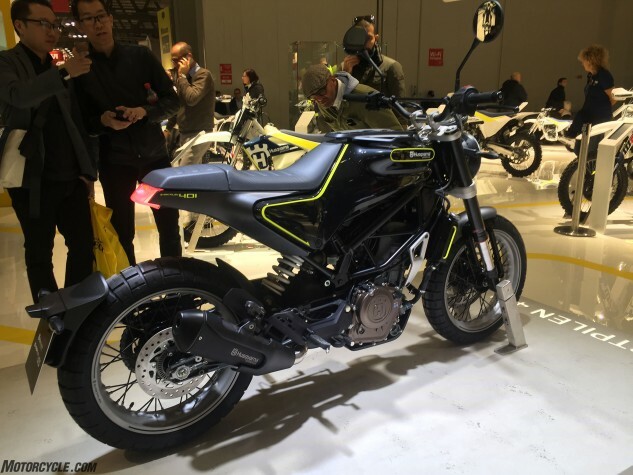 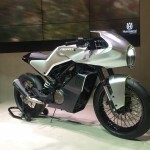 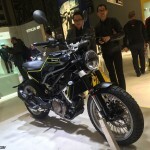 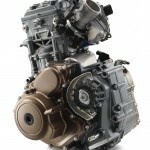 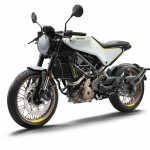 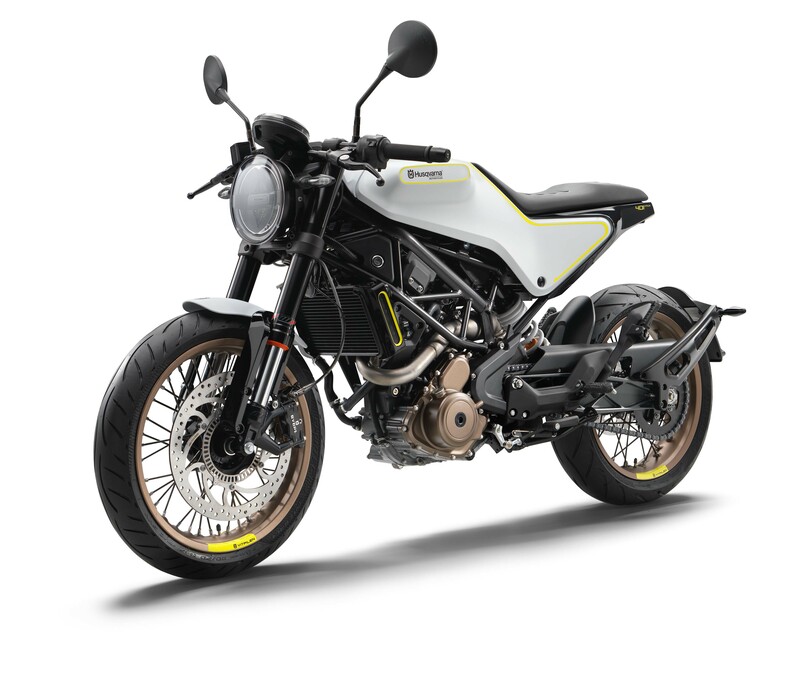 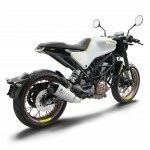 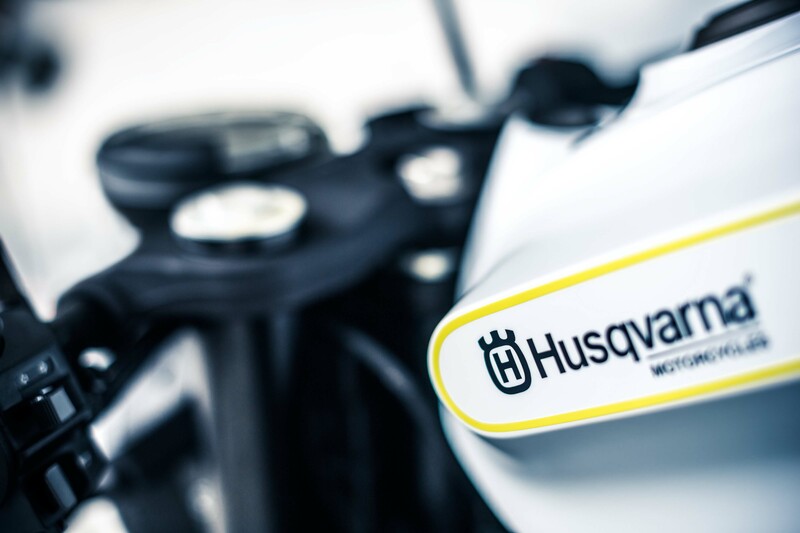 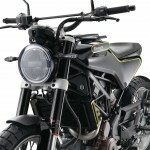 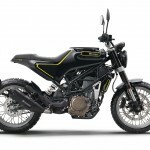 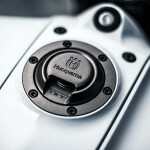 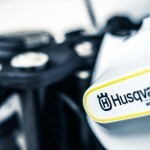 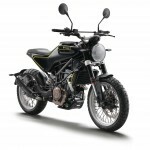 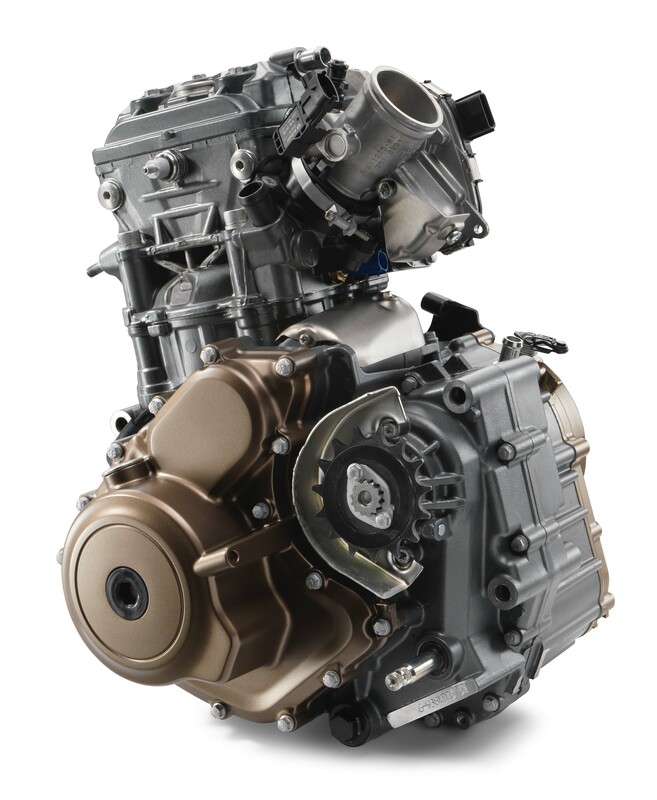 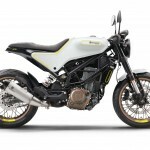 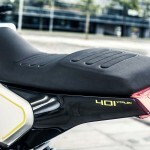 Husqvarna, you’ll recall, was acquired by KTM in 2013. 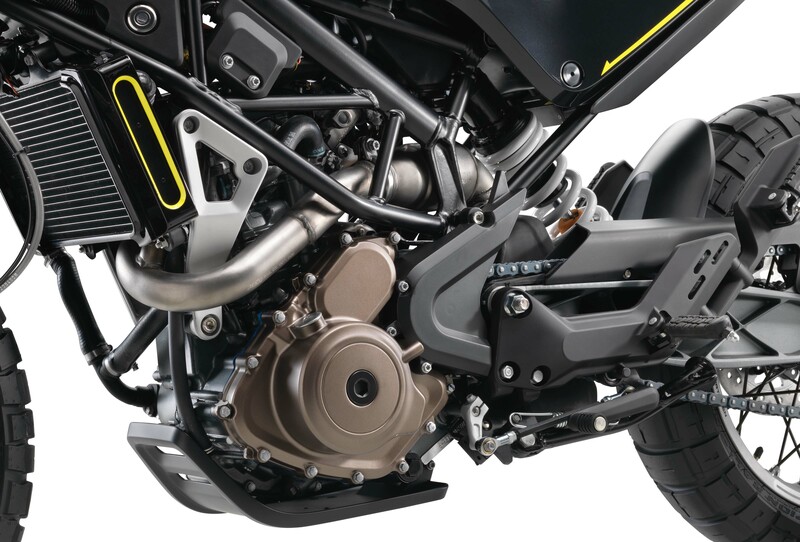 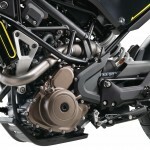 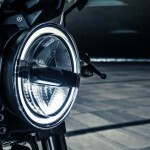 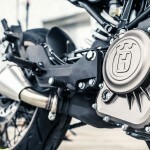 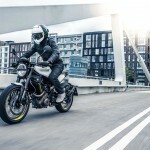 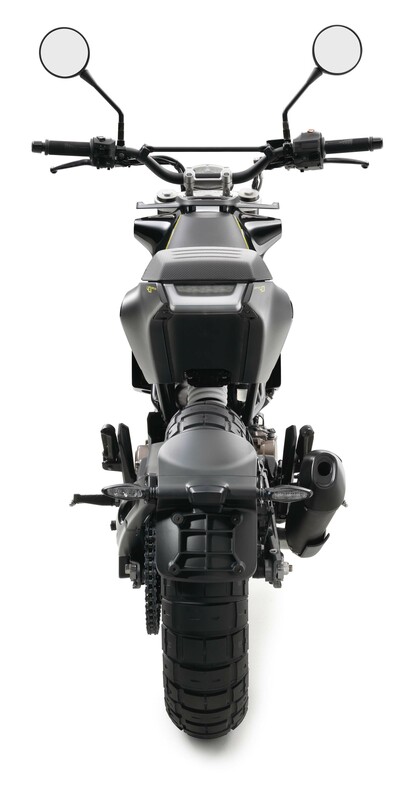 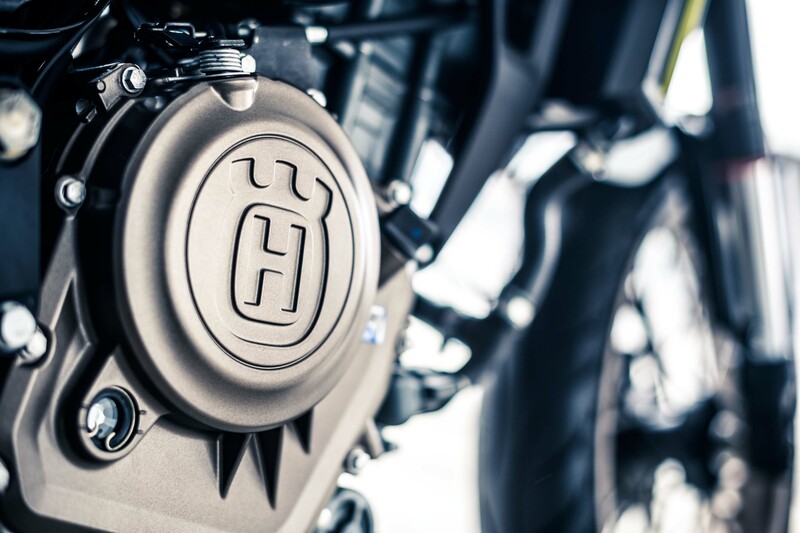 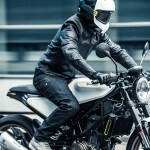 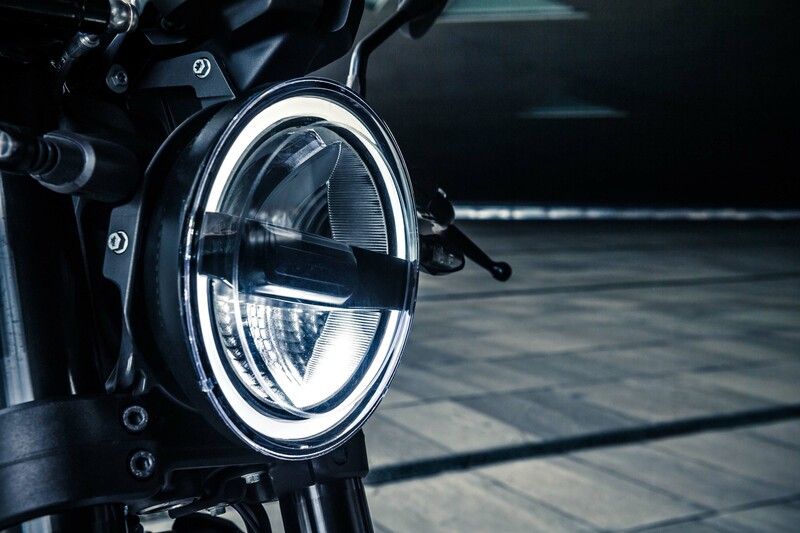 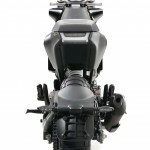 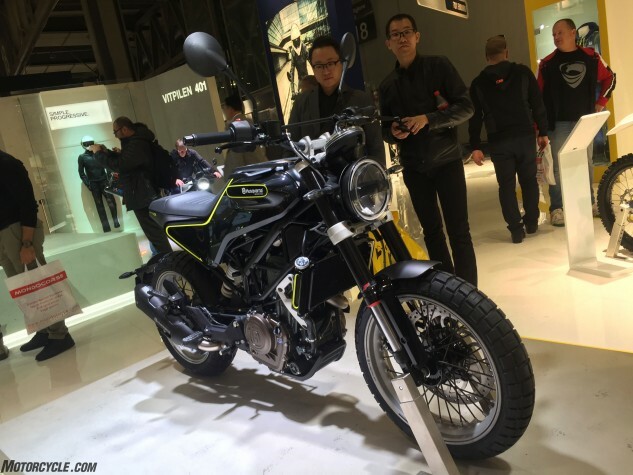 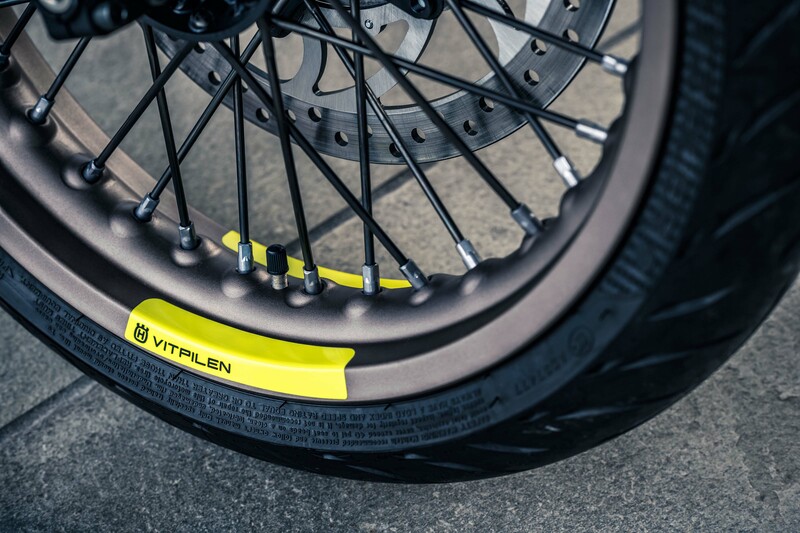 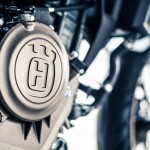 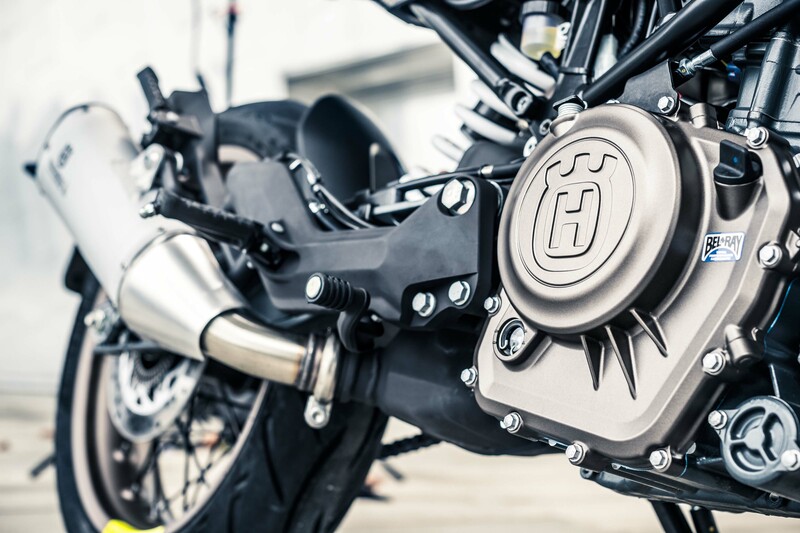 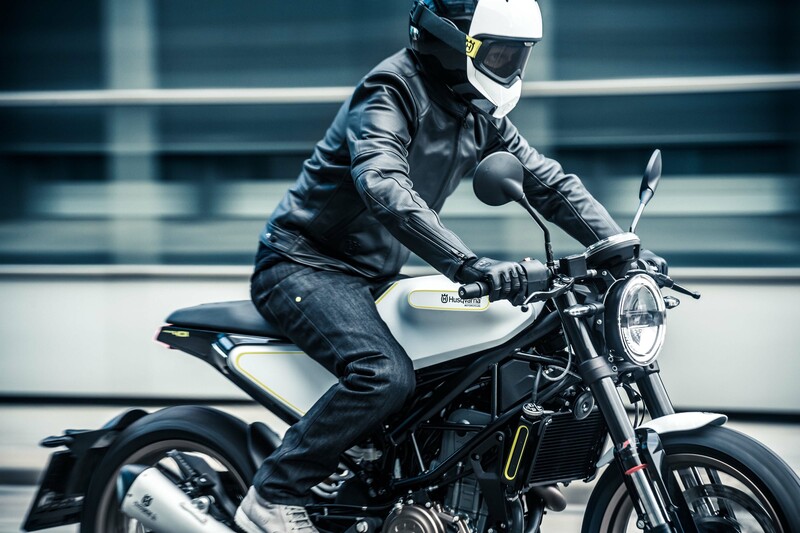 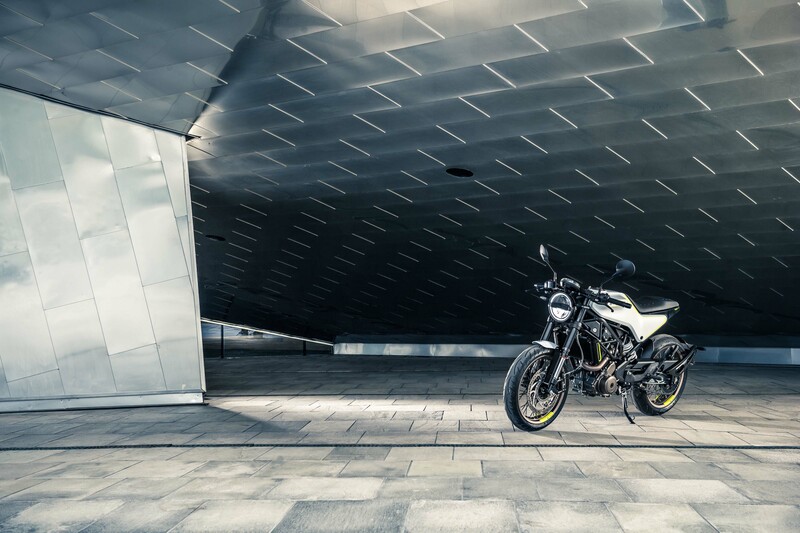 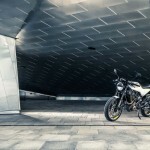 The Vitpilen’s thumper puts out a claimed 44 horsepower and has a slipper clutch. 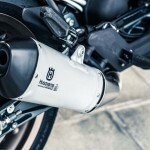 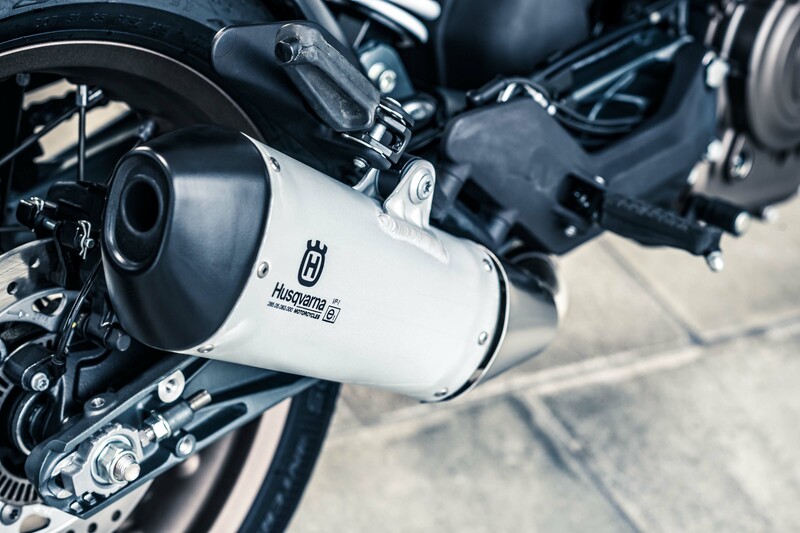 Waste products exit through a steel/aluminum exhaust that looks like it came from Akrapovic. 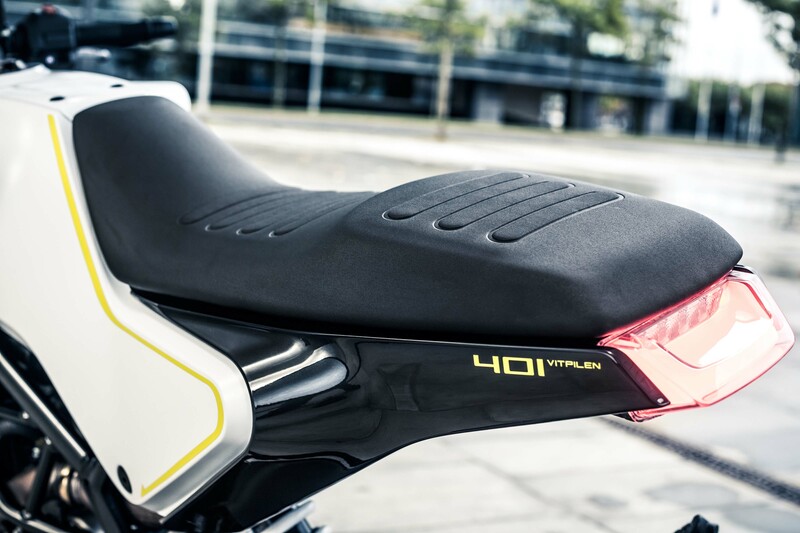 The shapely fuel tank carries 2.5 gallons of gas, lighting is by LED, there’s room for a small passenger on the long seat. 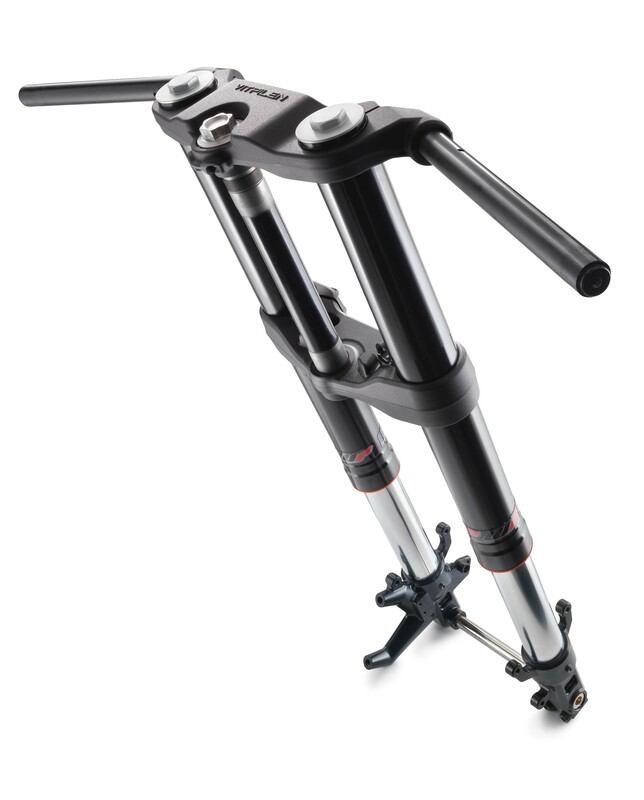 Suspension is by WP. 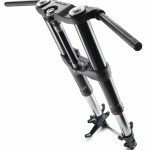 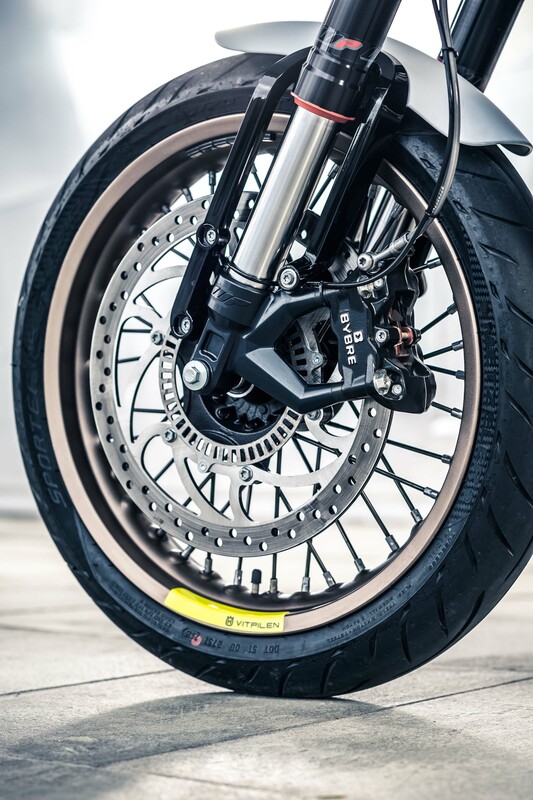 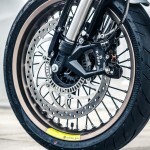 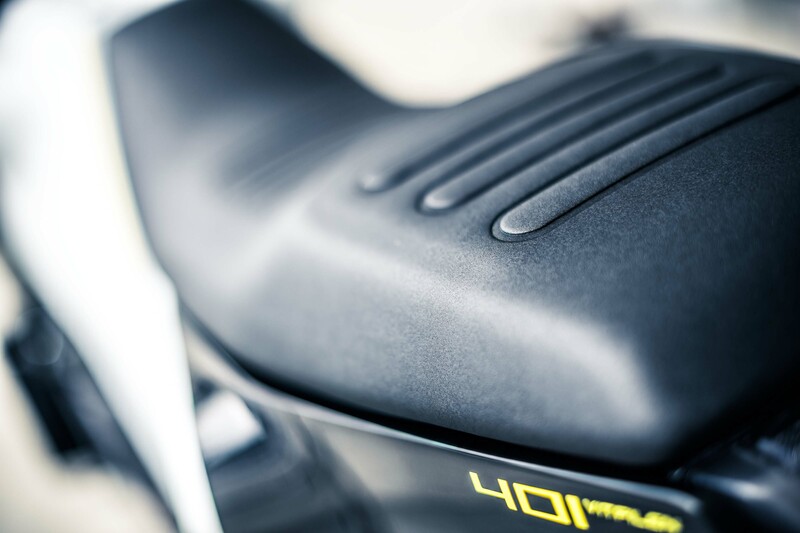 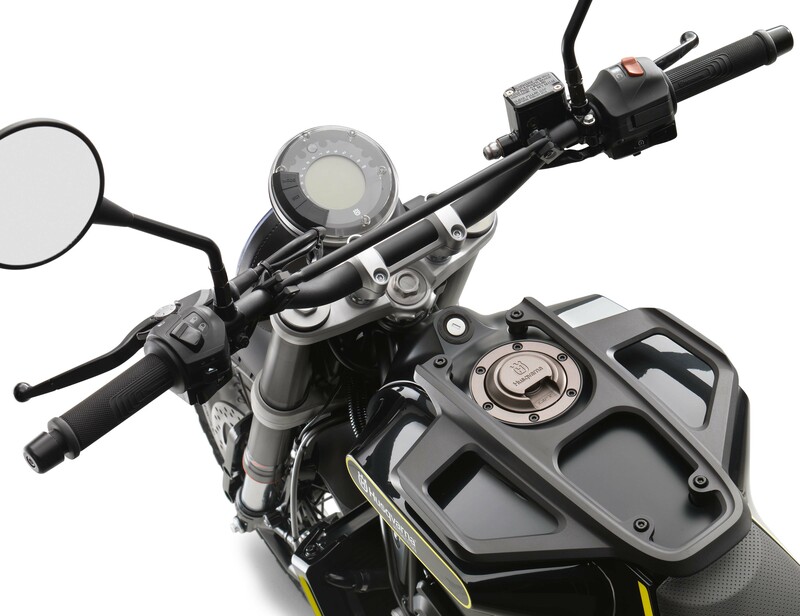 Front and rear disc brakes are backstopped by Bosch 9.11MB ABS, and Metzeler M5 tires provide traction. 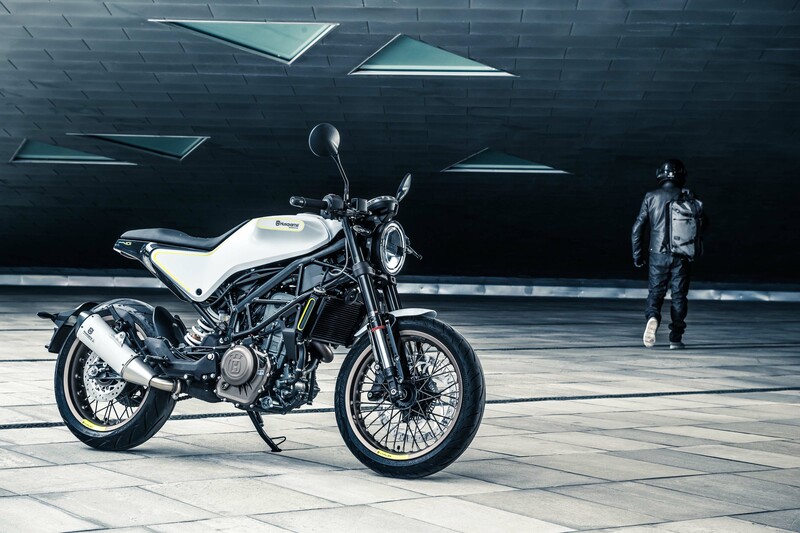 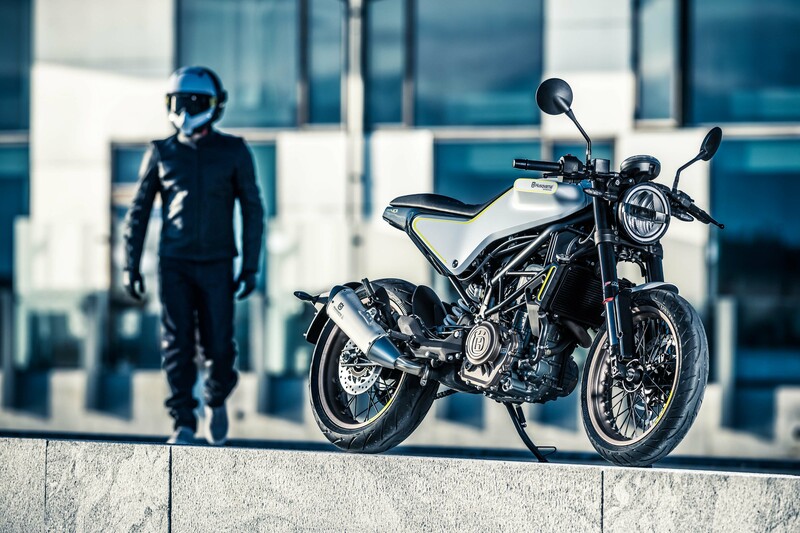 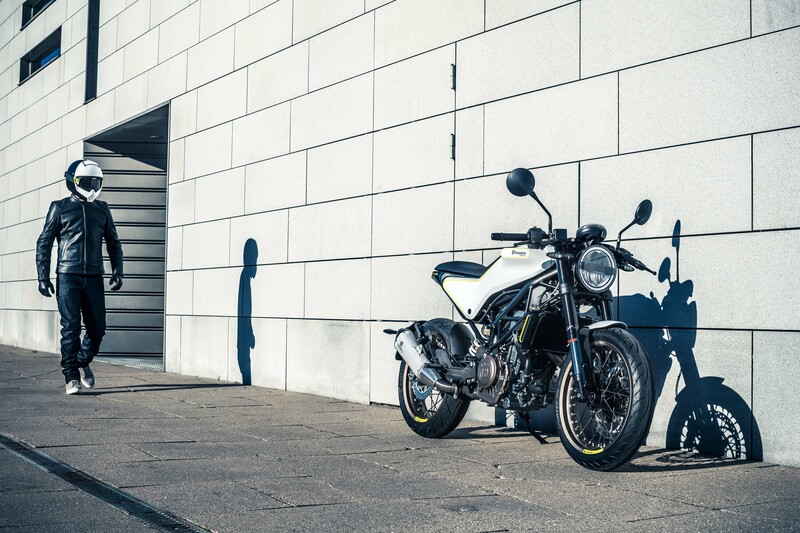 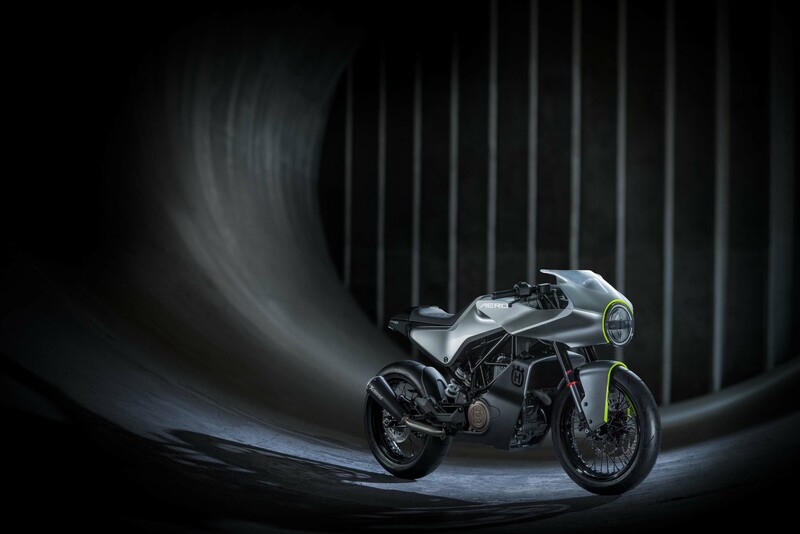 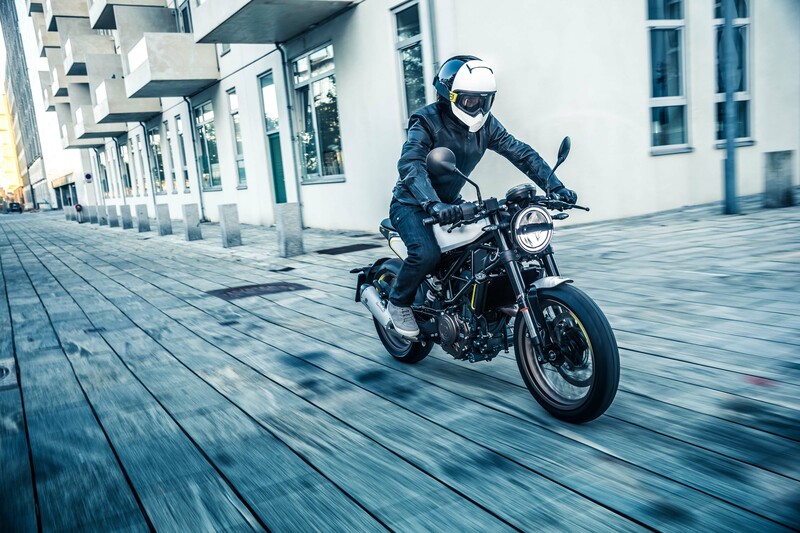 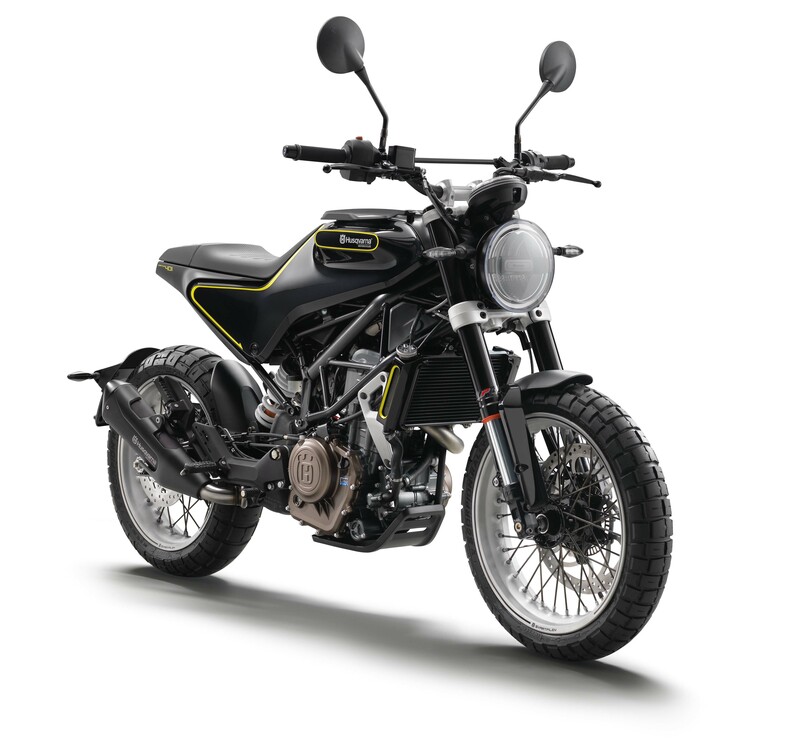 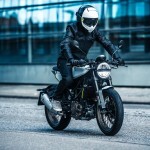 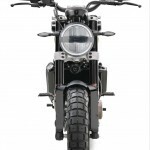 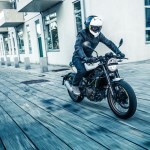 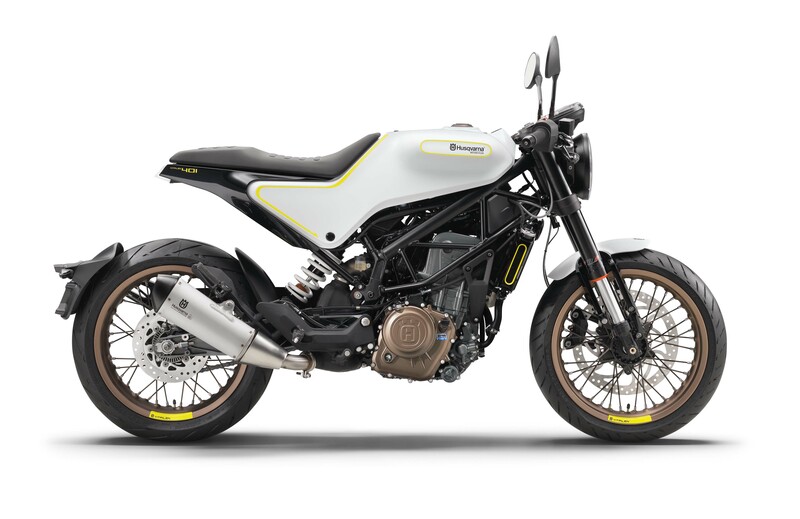 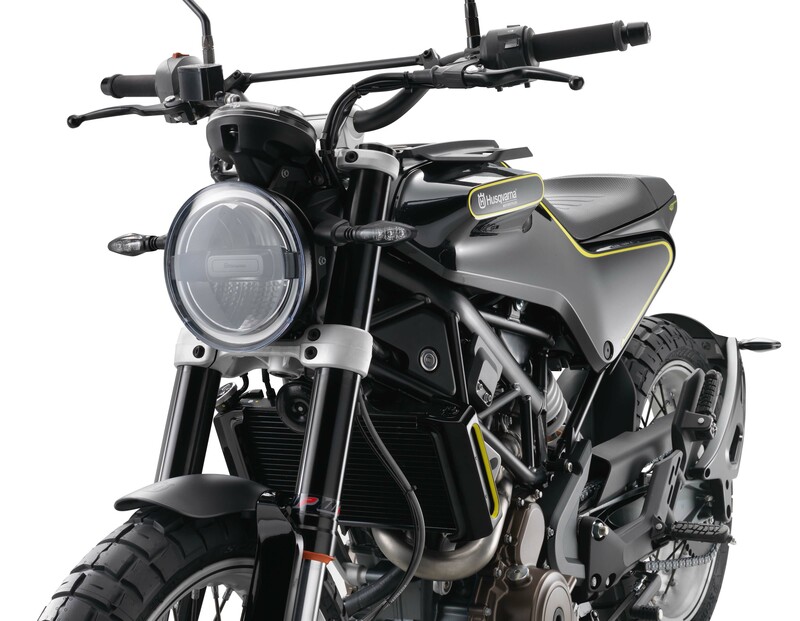 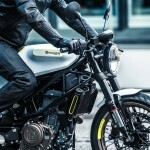 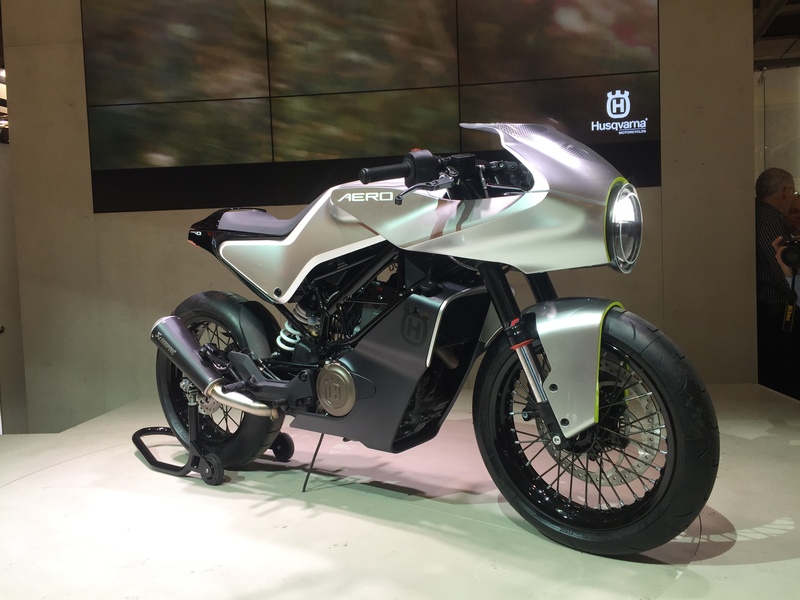 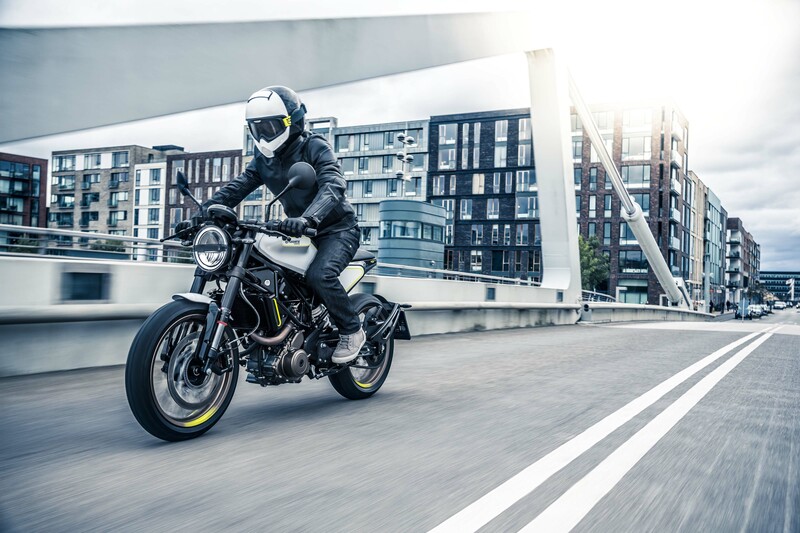 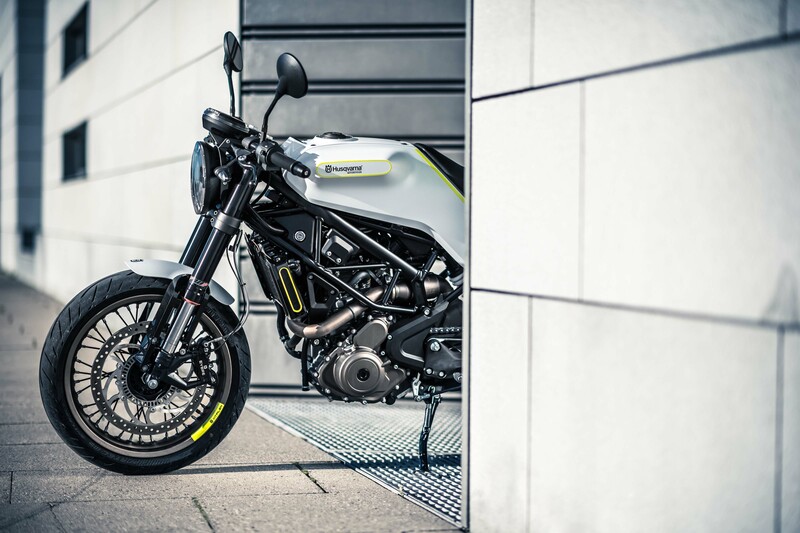 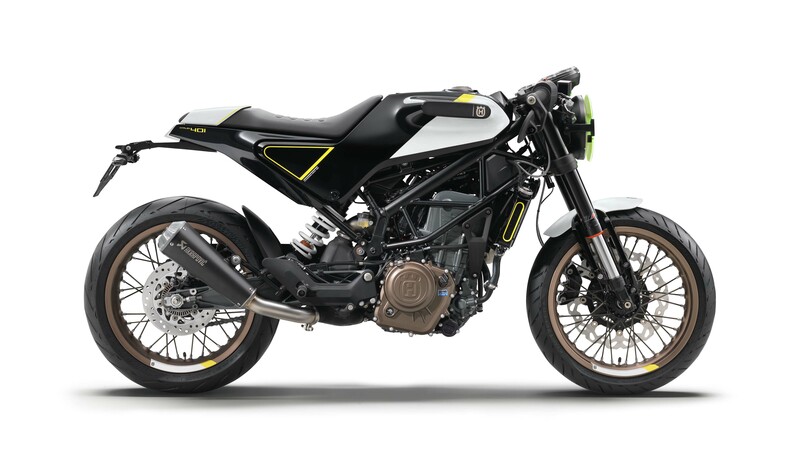 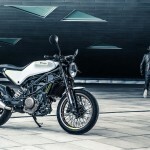 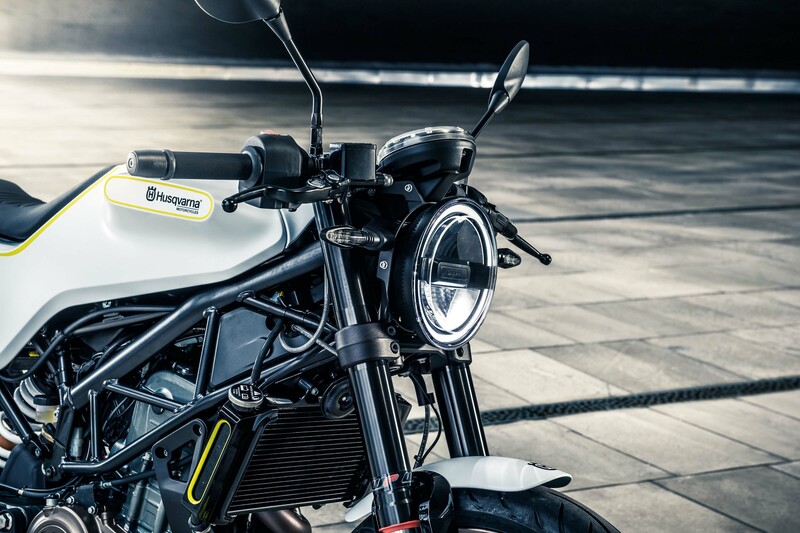 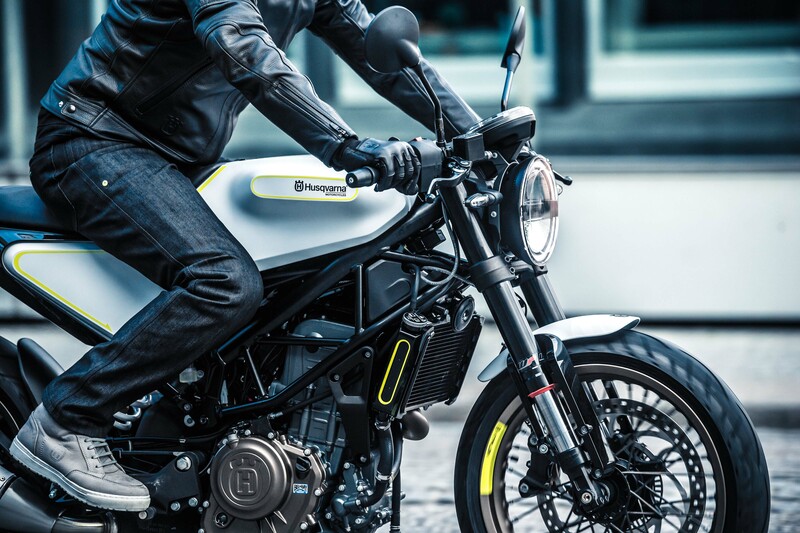 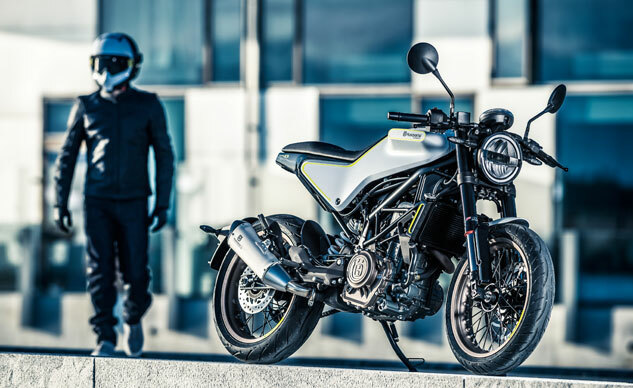 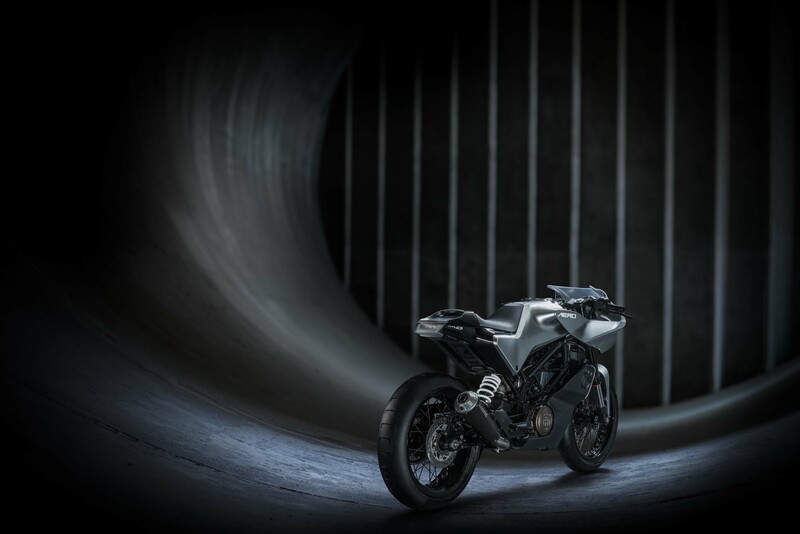 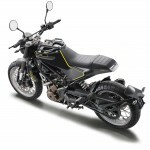 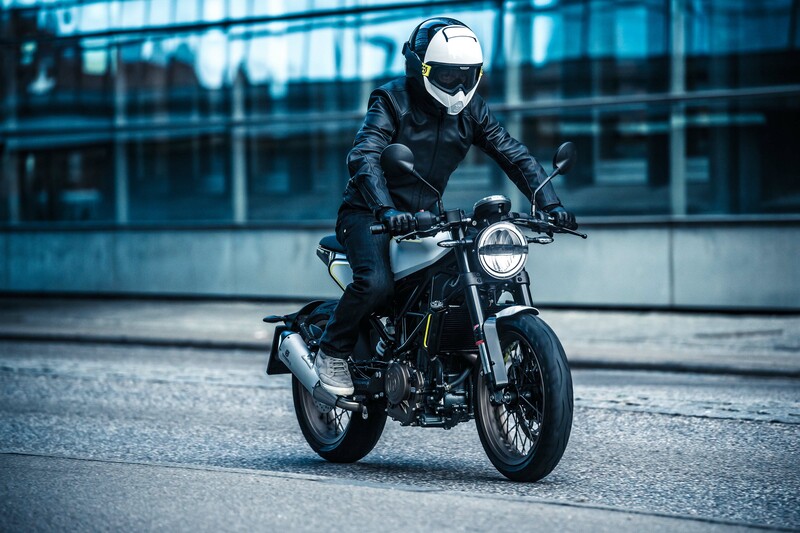 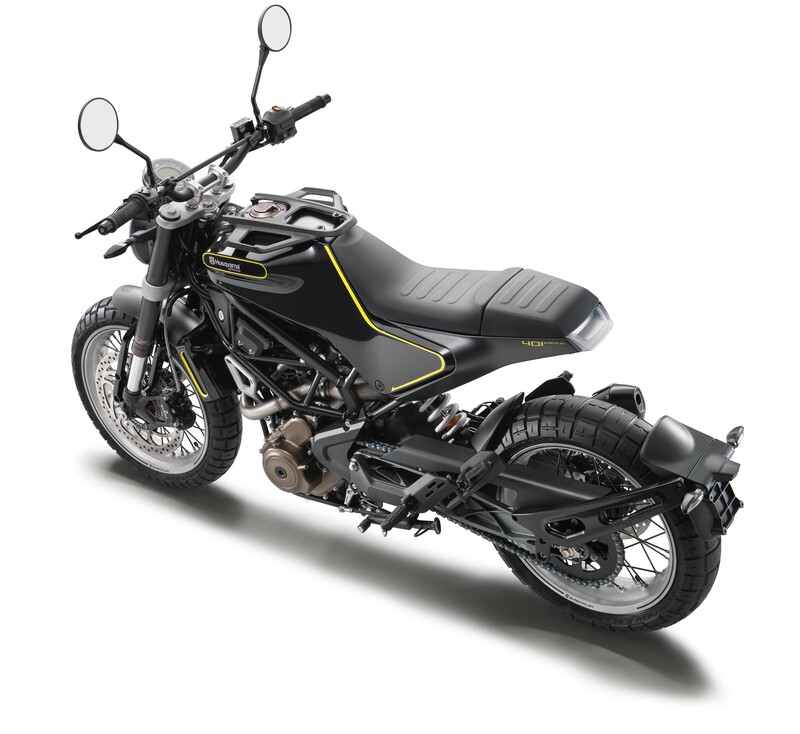 Then there’s the Svartpilen, which uses that same 44 hp, 373cc Single and trellis frame to form another leg of Husqvarna’s ‘Real Street’ bike range, this one a modern-day interpretation of a street explorer. 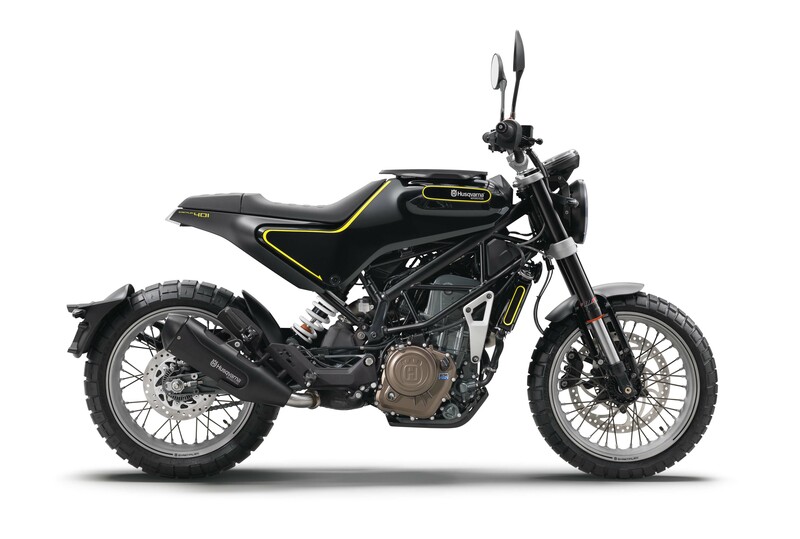 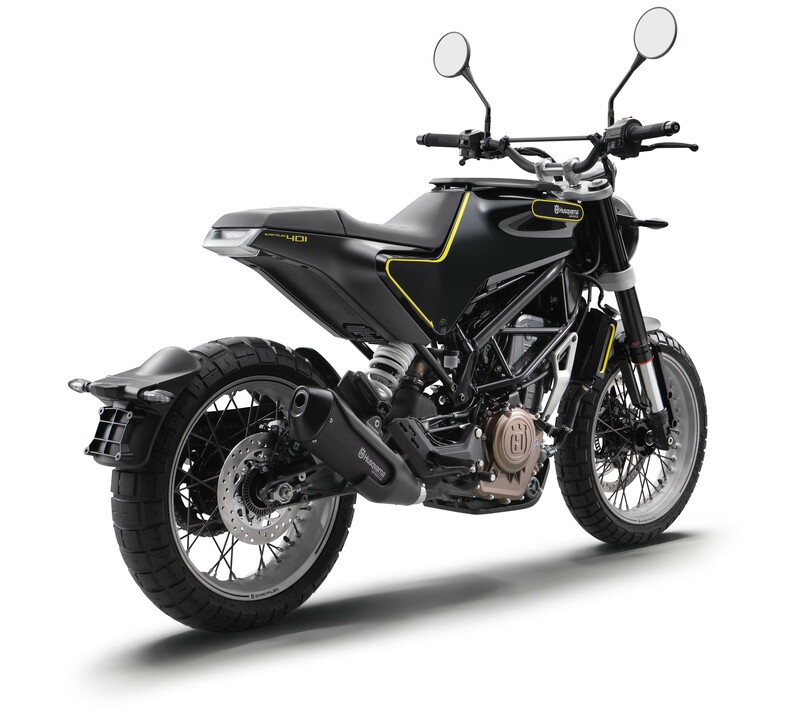 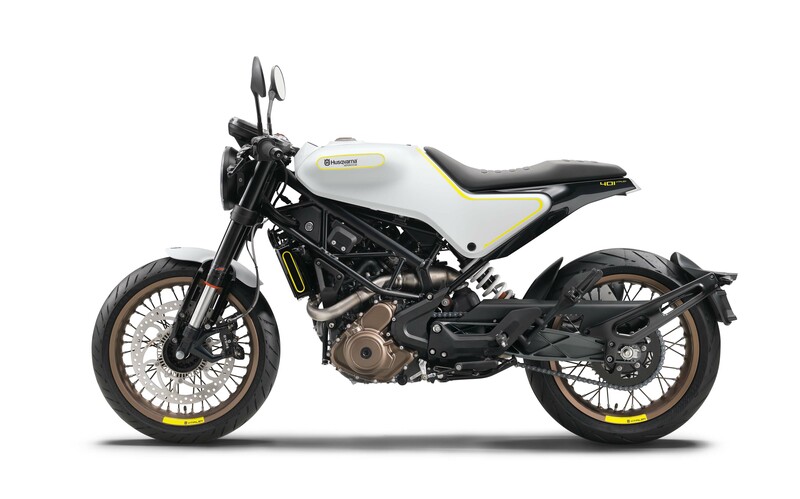 Though highly focused on everyday functionality, its Pirelli Scorpion Rally STR tires, tank rack and small skid plate say it means business. 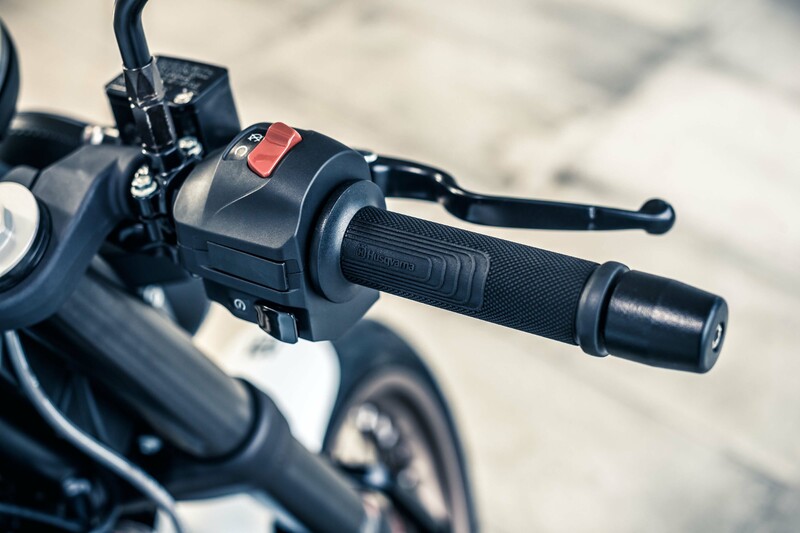 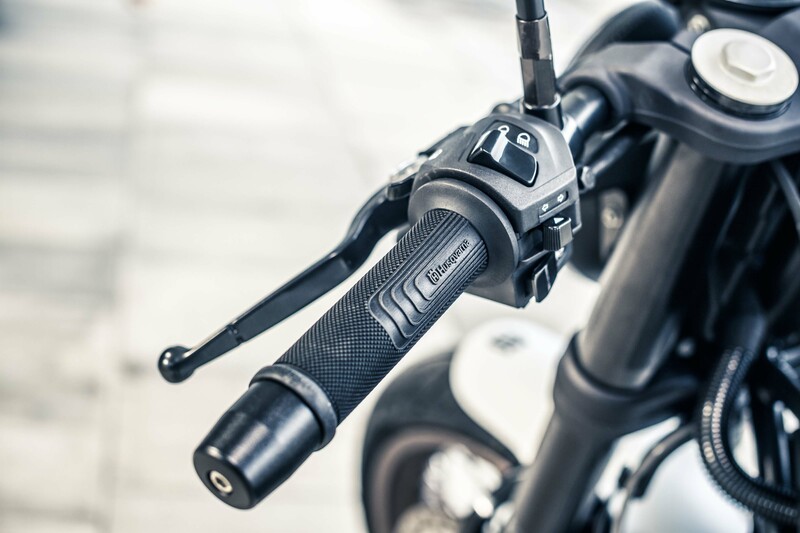 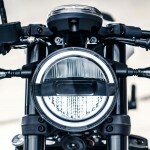 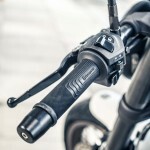 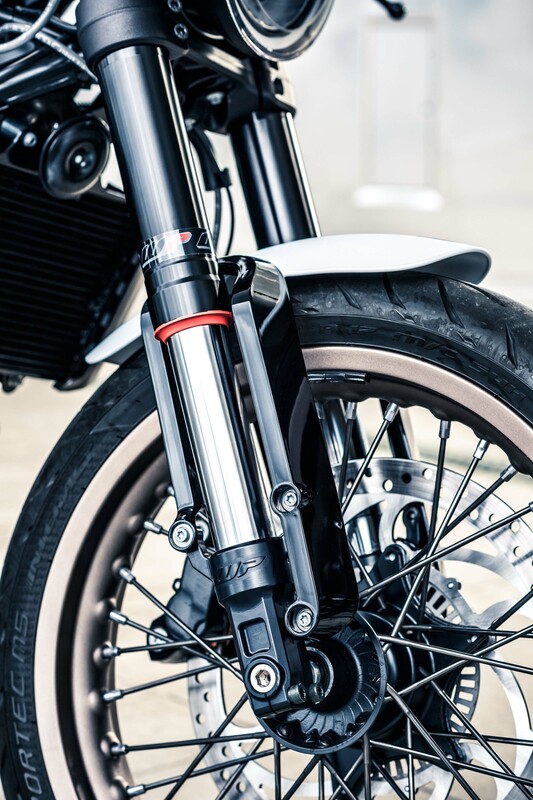 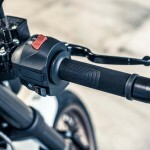 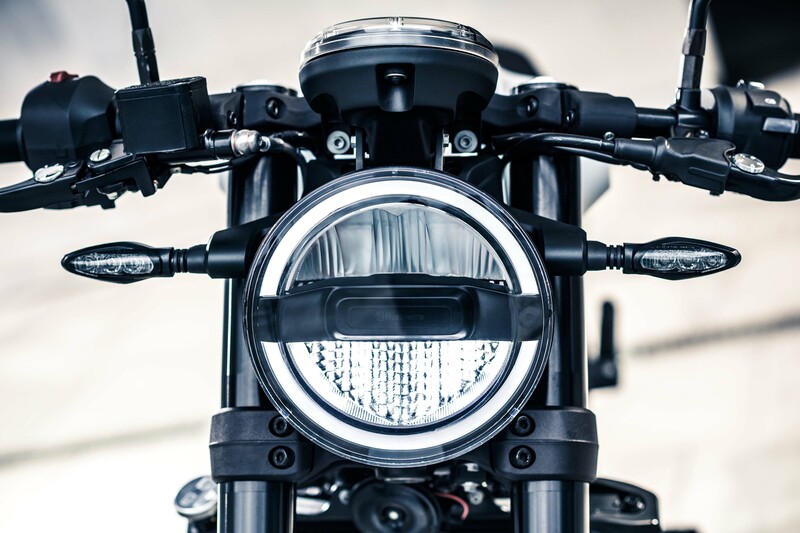 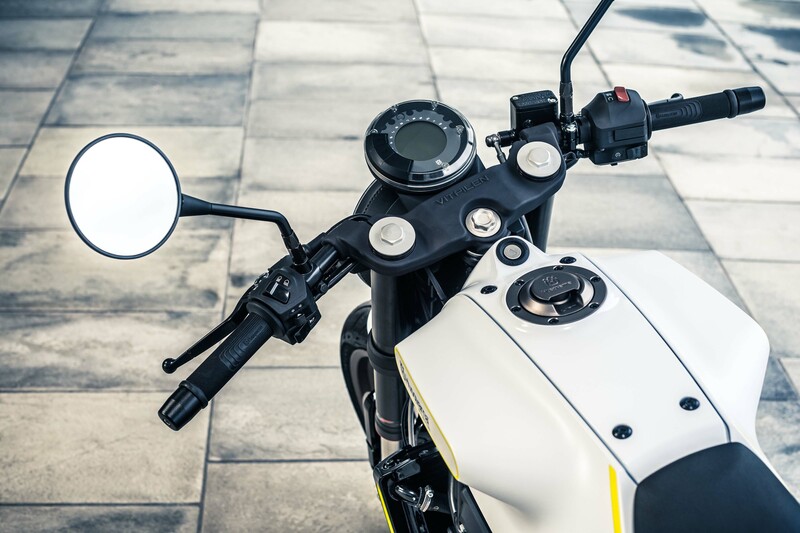 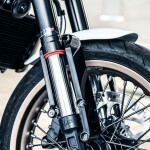 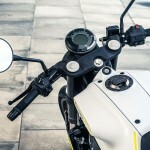 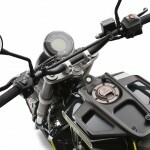 The Svartpilen’s motocross-style handlebar provides a more upright riding position, and a fabric-covered two-piece seat further distances it from brother Vitpilen. 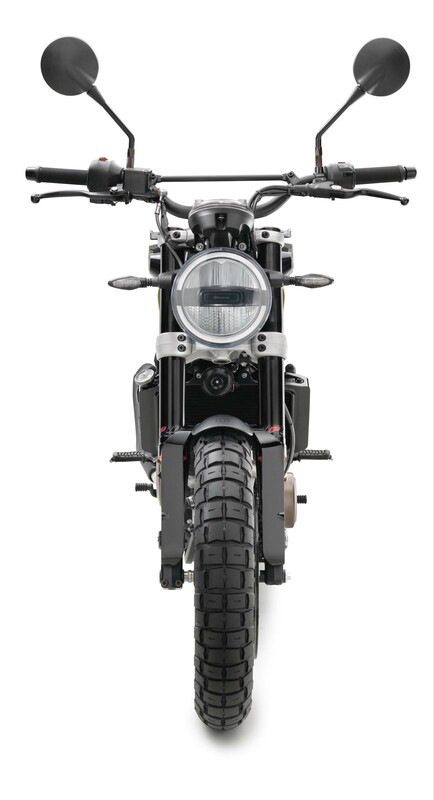 Otherwise, it too rolls on WP suspension, Bosch ABS, and premium LED lighting fixtures. 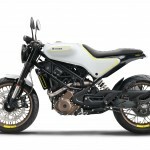 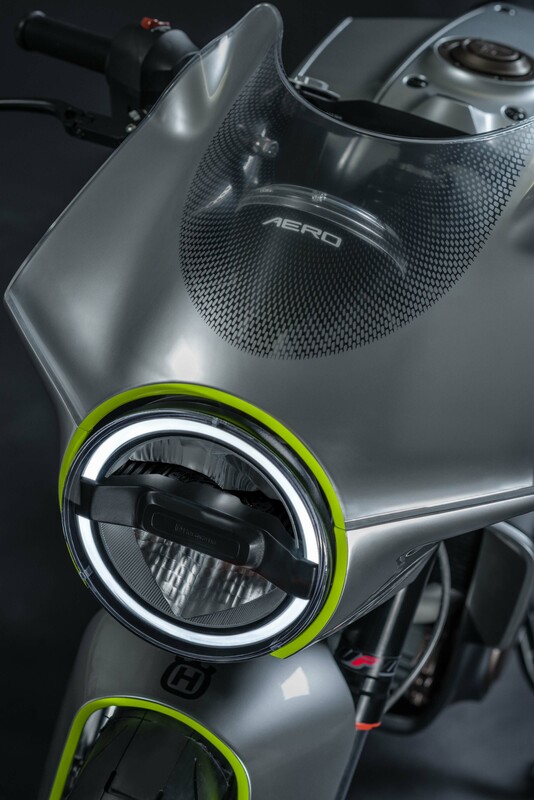 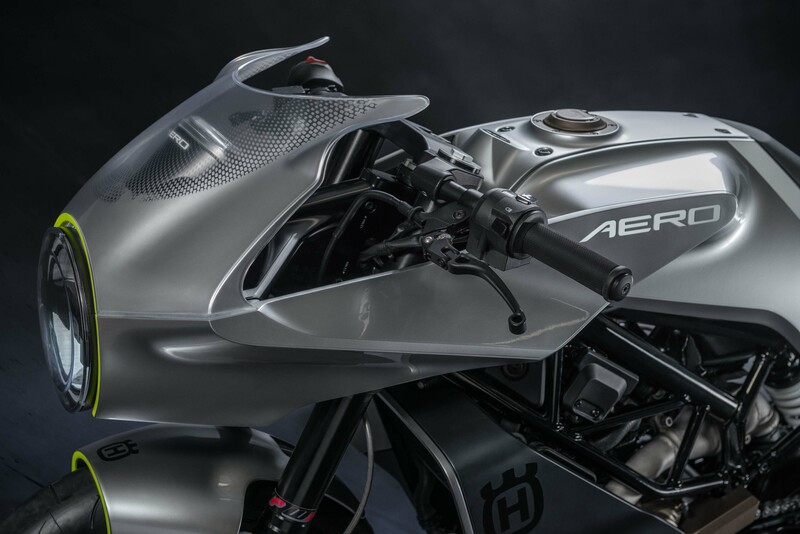 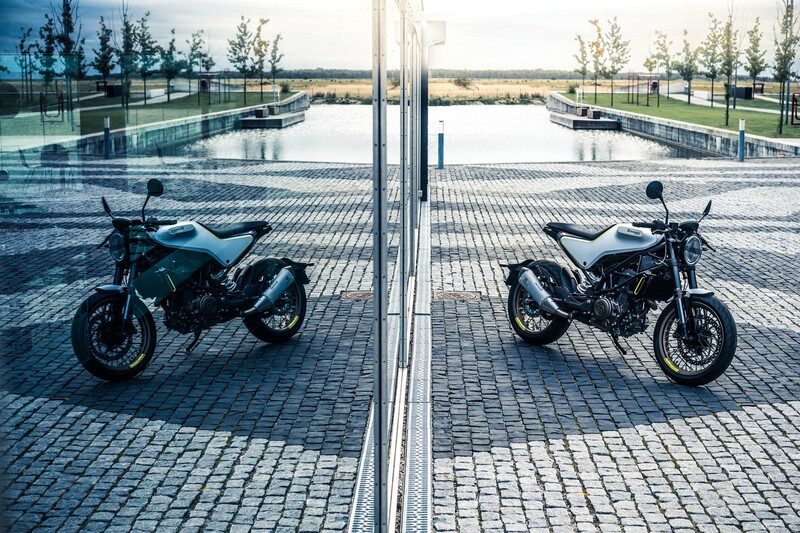 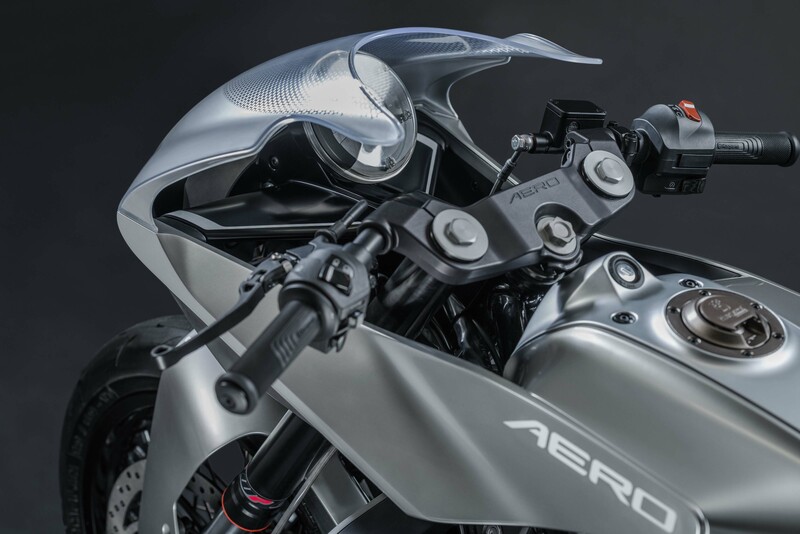 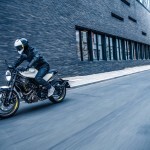 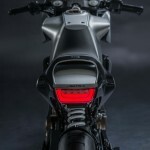 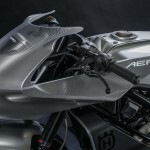 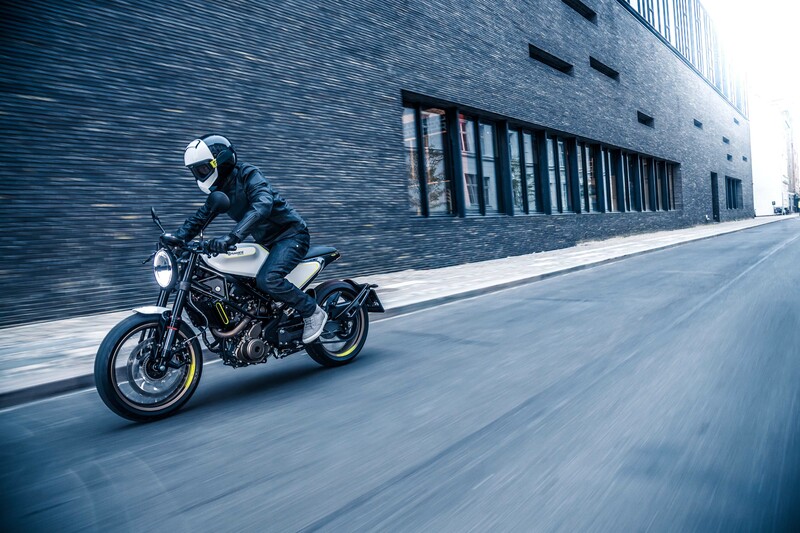 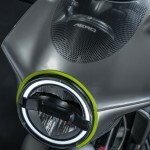 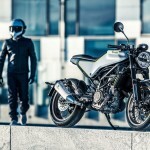 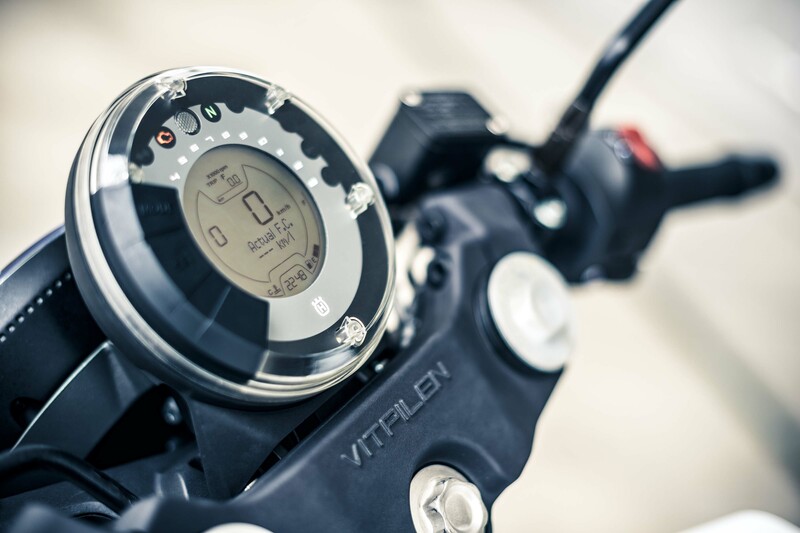 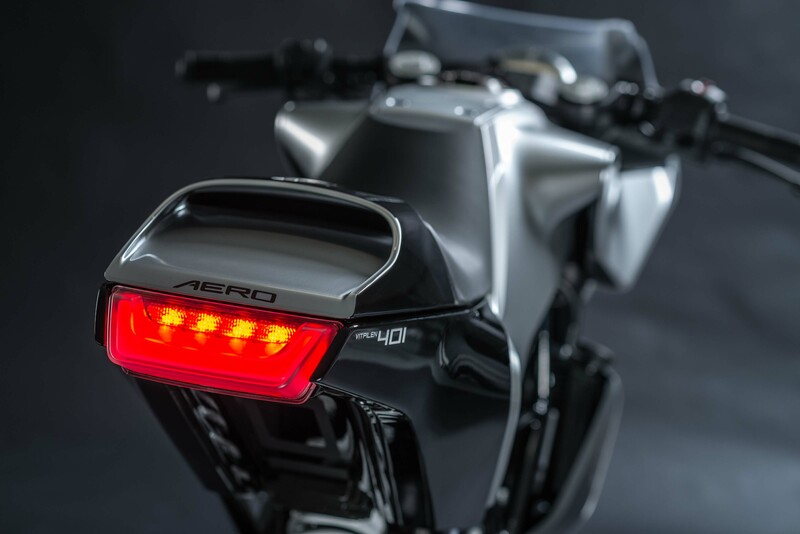 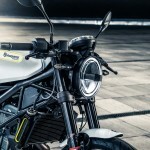 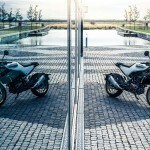 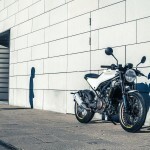 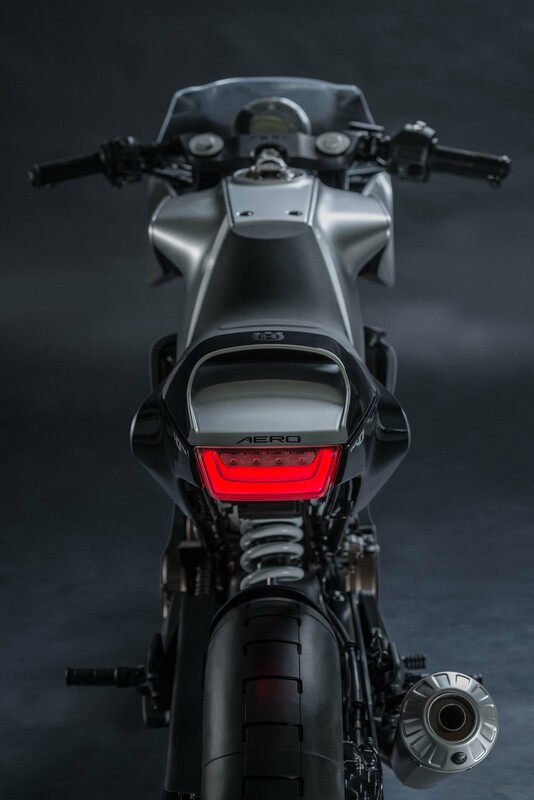 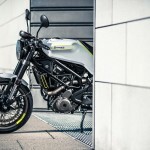 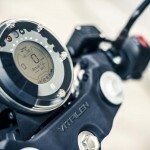 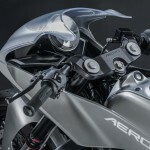 Expect to see both Vitpilen and Svartpilen next fall in showrooms – and oh, yeah, there’s an “Aero” version of Vitpilen on the way too.